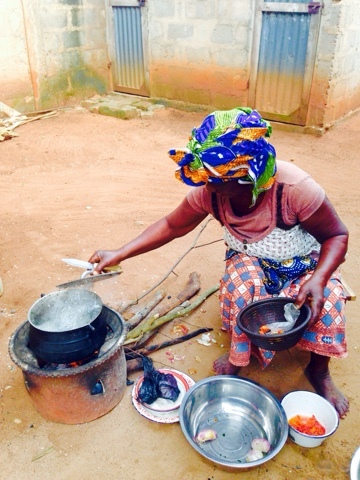 One of the most frequently asked questions I received before coming to Benin was "what are you going to eat for two years?!" While I wasn't really concerned about my options here, I knew that there would be some major changes in my diet. I have been very pleasantly surprised at the abundance and availability of fresh fruits and vegetables (that we can only eat after several washes and bleach rinses), nuts, grains and yogurt! The traditional Beninese dish, paté, can best be described as a cold, hard, plain cream of wheat. It's served as a scoop that the Beninese take chunks off of and dip into a sauce. I prefer it warm, piping hot actually, and would love to try some with a little cinnamon sugar and raisins for breakfast (Dream big, Carly!). What the paté lacks in intrinsic flavor (it really is just flour and water), the accompanying sauce makes up for. Most of the sauces I have tried so far have been either tomato based or composed of a stringy legume that has a sticky consistency. Needless to say, I was excited when my mom asked if I would like to try traditional Beninese sauce d'arachide. 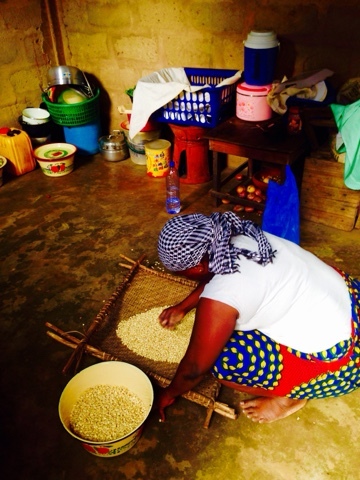 Arachides are technically groundnuts in French, but here in Benin, the term is used for peanuts. They are sold on the street boiled, dry roasted and shelled and in every size and shape cookie you can imagine. We have even found the equivalent of peanut butter here (it will be great with the Fluff I brought over... Yes, I brought Fluff for a rainy day). I got home from school today excited about cooking this new dish. So far, I've learned how to make Paté, rice, couscous, salad (veggie prep) and fish (gutting a whole fish), probably because I spend most of my time at home in the kitchen. While it was unrelated to tonight's meal, I helped my mom (Constance) pick out corn kernels from a huge bag that she bought at the market. Although I was hoping for popcorn, we sorted out all the kernels, picking out the bad seeds, before carrying the bowl down the road to the mill. Tomorrow we'll go back to pick up our freshly ground corn meal! The arachide (darn autocorrect keeps changing these to arachnids-- I can ASSURE you that I'm not eating spiders!) prep started at our trusty grinding stone. This is the same stone we use to prepare Pima sauce (like chili paste). Instead of grinding up whole peanuts, Christiane ground up some homemade peanut biscuits. She added water until it became a thick paste. 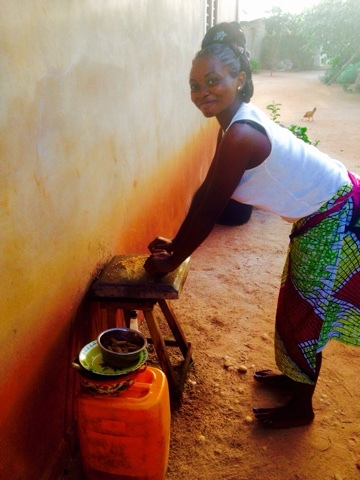 While we were grinding up peanut cookies, Fidele (grand-mere) was busy starting the rest of the sauce. She chopped up fresh tomatoes (they have grape tomatoes here in the market!) and onions and added them to some tomato paste. After it came to a boil, we added some pepper, salt, pima, and finally the peanut paste. It took some time for the peanut paste to break down in the liquid, but eventually the whole thing came to a boil. We added some prepared fish (because no meal here is complete without a meat group) and let it stew. Although I was expecting paté, I was served rice with the peanut sauce for dinner. It was delicious!! And, like most meals here where they try to constantly over feed me, I was served 19 bananas to top it off!